Journalist and author Paul Martin spent three decades as a magazine and book editor with the National Geographic Society, the last ten years as the executive editor of National Geographic Traveler magazine. His feature articles have appeared in a wide variety of National Geographic print and online publications, as well as on Smithsonian.com and other popular websites. His numerous writing assignments have taken him around the world. 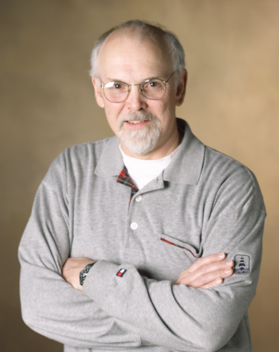 A lifelong history buff, Paul has gathered information on inspiring unsung Americans for years. 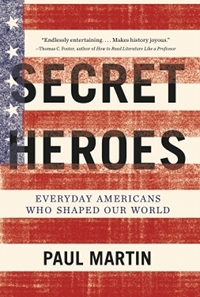 He selected some of the most interesting of these characters for his book Secret Heroes, from the forgotten tailor who saved George Washington’s life to the famous actress who was secretly a brainy inventor. “I only wrote about people whose heroism had enduring and widespread significance.” Meet the heroes. Next, Paul profiled a group of people who were the complete opposite of heroes—American rogues. 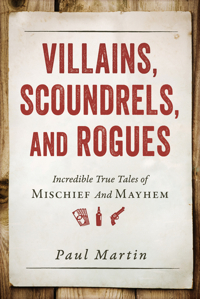 “I wanted to find the most colorful examples of every sort of villainy and rascality.” Villains, Scoundrels, and Rogues includes startling ne’er-do-wells from throughout our country’s history, from the rabid, homicidal judge who presided over the Salem witch trials to the Wild West madam known as Squirrel Tooth Alice. Meet the villains. Most recently, Paul has written about individuals who performed some original feat that’s been overlooked or that gets only a bare mention in history books. 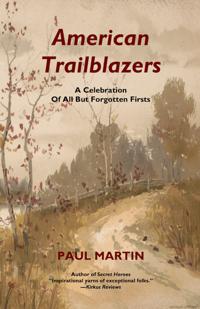 “American Trailblazers presents a gallery of these transformative figures,” from the free-spirited publisher and stockbroker who became the first female to run for president to the little-known Idaho farm boy who created the first electronic television system. Meet the trailblazers. Copyright © 2012-2019 by Paul Martin. All rights reserved.